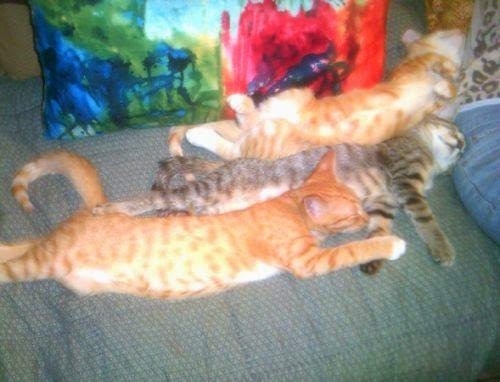 I don't know the exact day my four cats were born, because they were born outside. I do know they were born at the end of July, so I am officially announcing today, July 31st, as their birthday. They are one year old! I want to celebrate their birthday by sharing their cutest pictures from the past year. The twins, Milo and Otis. All four sleeping under my table. Clover playing on my book case. Taking up all the room on my couch! 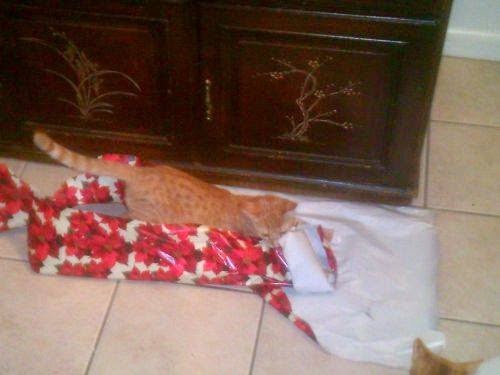 They were helping me wrap Christmas presents. I put up my Christmas tree on Christmas Eve for my families party. 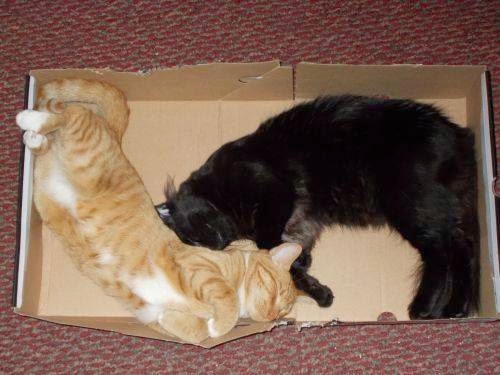 I had to lock my kittens in my bedroom and let them out afterward, which is when they did this. That's Clover at the top. 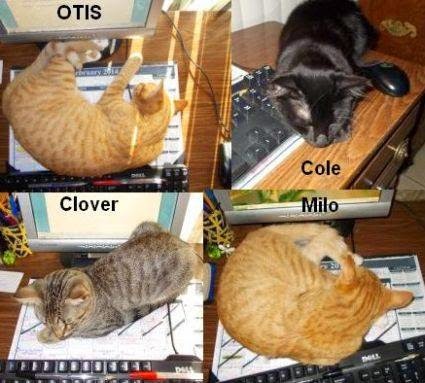 They all like to sleep on my desk. 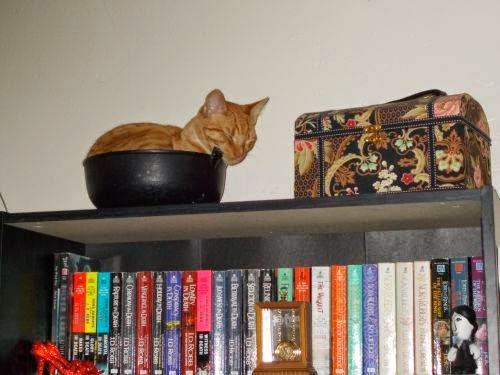 Otis sleeping in the witches cauldron on top of my bookcase. Cole sleeping on my thick, winter blanket. They tore apart the ear buds for my MP3 player. And put one in their water dish. 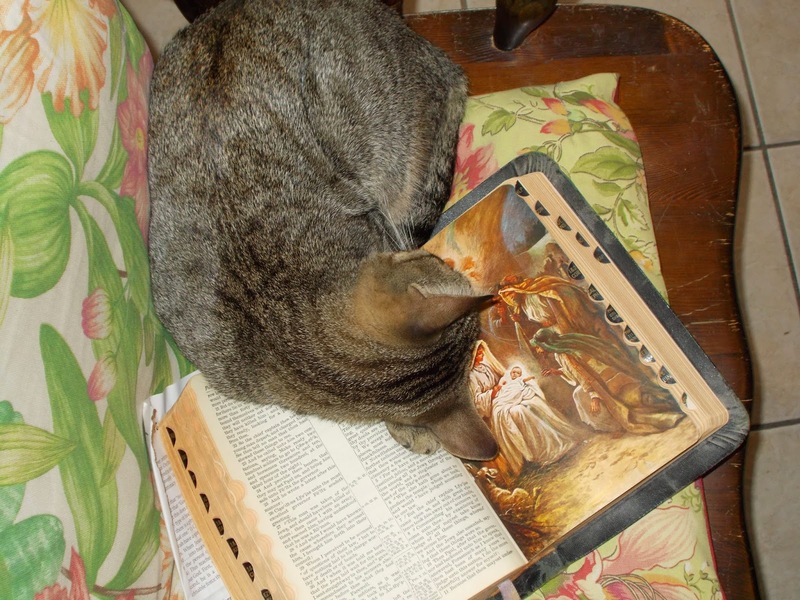 Clover sleeping with the Bible. 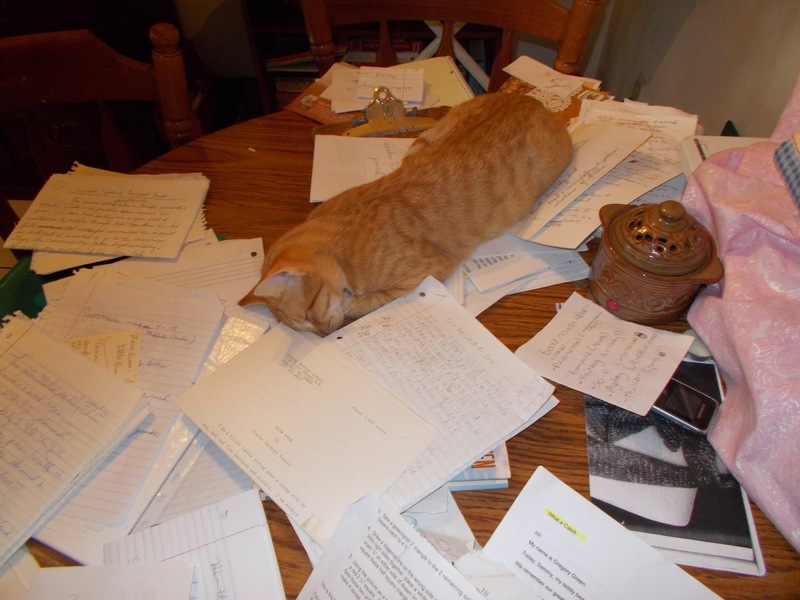 Milo sleeping among a chaos of papers. Clover and Otis hiding under my desk. I really need to get rid of all those computer cords. 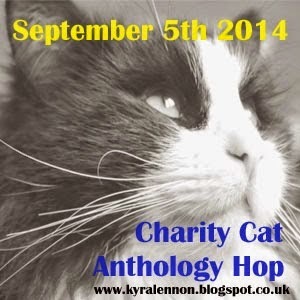 Stay tuned because on September 5th I'll be sharing a short story about the day I rescued them for the Charity Cat Anthology blog hop created by Kyra Lennon. QUESTIONS: Do you like cats? Do you have any pets? 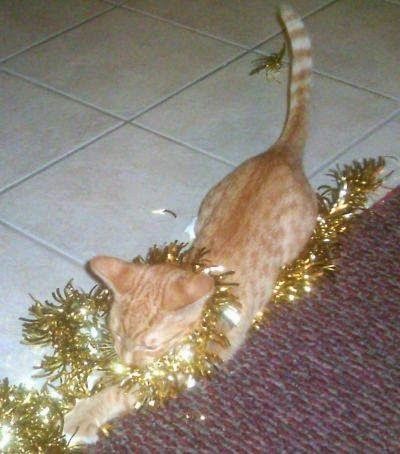 You decorate your tree with cats - that's really unique! They're cute. And from the way they are stretched out in some of the photos, I'd have to say boneless as well. lol Last year I sure did. 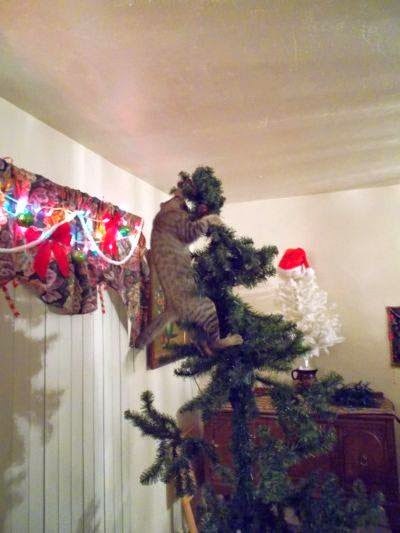 I hope this year they'll leave the tree alone, but I doubt it. Awww! They're so sweet and a handful no doubt. I am without pets the last few years and miss having a furry friend! My daughter rescued a kitten which we of course kept. Duke was his name and we loved him so. We only had him for 6 yrs though. He got taken by a coyote. :(. Still miss him. 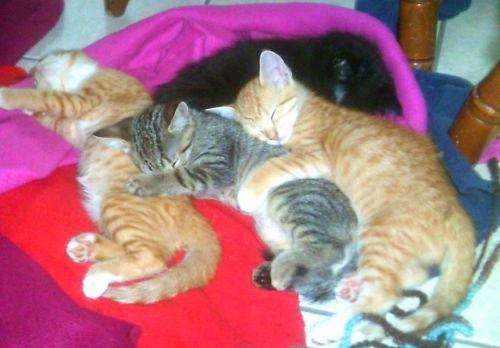 4 kittens is a lot of work and fun! Nice share, Chrys! They are a BIG handful! 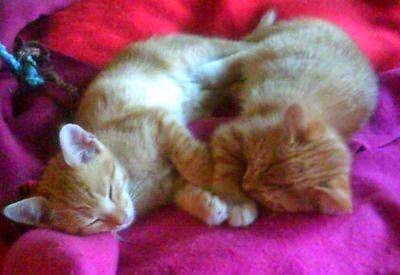 I rescued them when they were 2 months old and saved them from an unknown fate as stray cats. They are scared of other people and still hide when someone knocks on my door. So cute! Cats are the one animal we can't have because my husband is allergic, and I think my kids are too. Shame though. They are adorable. Thank you, J.L. And they sure do! LOL! Aww, such adorable pictures! I love cats. I have one, Misty, and I love her to bits. She's black like your Cole, though she's long haired so she's fluffier. I'll be writing a story for the anthology, too. I did a double-take on the first Christmas tree picture. It looks like Otis or Milo (I can't tell them apart) is chasing a snake. Turns out it was Clover's tail and hind quarters. Spooky! Yes, four are a BIG handful. I just don't want to split them up yet unless my mom agrees to take two. They are scared of other people, so I would have to keep them in the family. They are adorable! I'm sure with four, they are into everything. We don't know for certain when Rocko and Spunky were born either. Since Calvin died on July 17, we gave them the birthday of July 18. I always joke our white Calvin died a positive and came back as two black negatives. Yes, they get into everything. 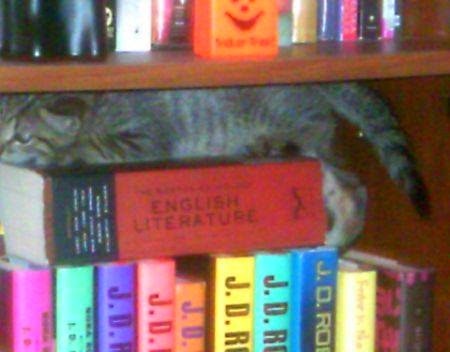 They climb on top of my bookcase, get into the cabinets, and sleep on shelves in my closet. I'm sorry to hear about your Calvin, but it's great that you have Rocko and Spunky. By the way, those are the cutest names! ICE in his water bowl. Happy birthday to your feline crew. Those Christmas tree pics are hilarious. We have two teen cats and they are into everything. They are indoor cats and are enjoying the mild summer as we have had the windows open lots--they can then spy on the rest of the world. Thank you! I'm glad you enjoyed the Christmas tree pictures. My cats love the windows, too. They love them so much they climb up my curtains. HAHA! LOL! Milo looks just like my Tigger, just rather smaller. 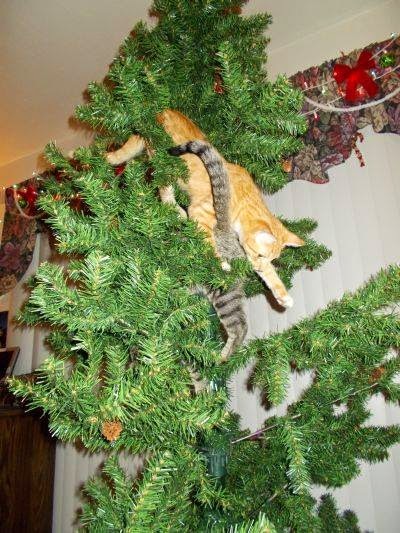 I love cats, we have six, and the Christmas tree escapade is all too familiar! Oh my goodness how cute are they? I LOVE cats. We have a black and white cat, Tilly, she is 7 now but she is a bit of a loner and doesn't like cuddles much. I miss cuddles. Our 17 year old darling died last year and I still miss her loads, she loved cuddles. What cute pictures! Happy birthday to your kittens! Holy moly, Chrys! You have quite the hilarious handful over there! I loved all of your pictures but my favorites were the one of Otis sleeping in the witches cauldron on top of your bookcase and the other one of them sleeping on your desk. They probably sleep all over your desk because that is where you do most of you work and they would rather have you all to themselves! These were too darn cute! I watch Hocus Pocus every year around Halloween=) Such a classic! Your cats are adorable! Happy birthday to them! Very cute. How wonderful that you kept all four! 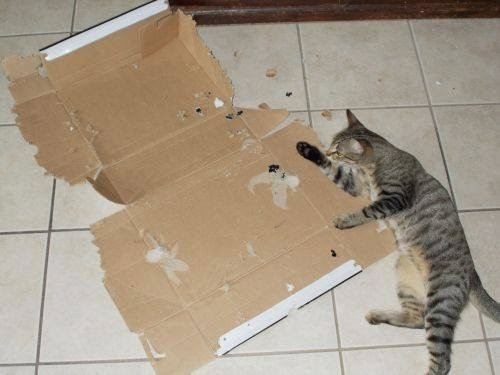 I just couldn't split them up. What darling kitties! Loved all the pics of them. I do love cats -- definitely more a cat person than a dog person-- but I've never really had any as pets because when I was a kid, my dad hated cats and loved dogs. And when I got married, my husband was the same and my daughter was highly allergic. 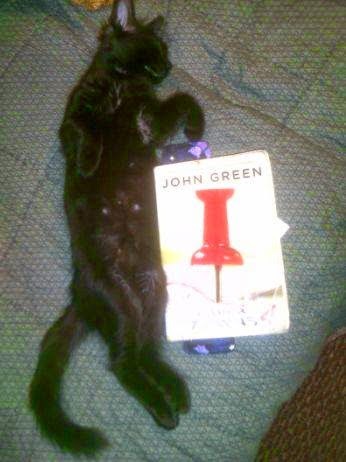 So I satisfy myself by looking at pictures of other people's cats. So adorable. I have three cats. They were born outside, but I sort of know when they were born since I got them as kittens. My two cats just turned ten and are named Cheswick and McMurphy. In early August 2004, I appeared in a community theater production of 'One Flew Over the Cuckoo's Nest' playing the character 'Cheswick.' Just before the play opened, I went to my car after a rehearsal and found two kittens in the parking lot next to my car They were so teeny-tiny that their eyes were barely open. One was gray and one was white. There was a cardboard box close by with newspaper in the bottom; they had obviously been abandoned. 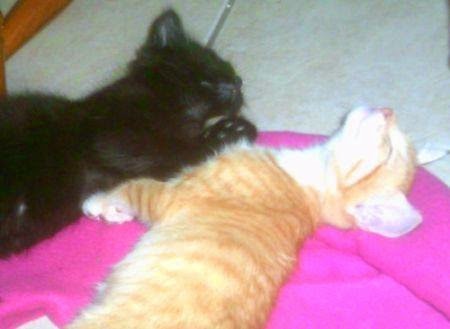 They went home with me that day, and I named them after two of the characters in the play. 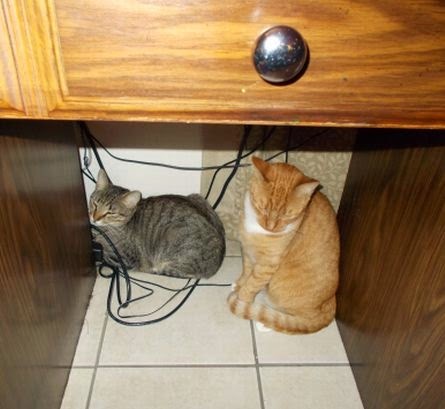 They both have been my constant and beloved companions (the white one, Cheswick, is sitting by my shoulder looking on as I type this) ever since that day. Fortunately, my wife loves kitties just as much as I do, so being their 'cat guardians' has been a family affair. 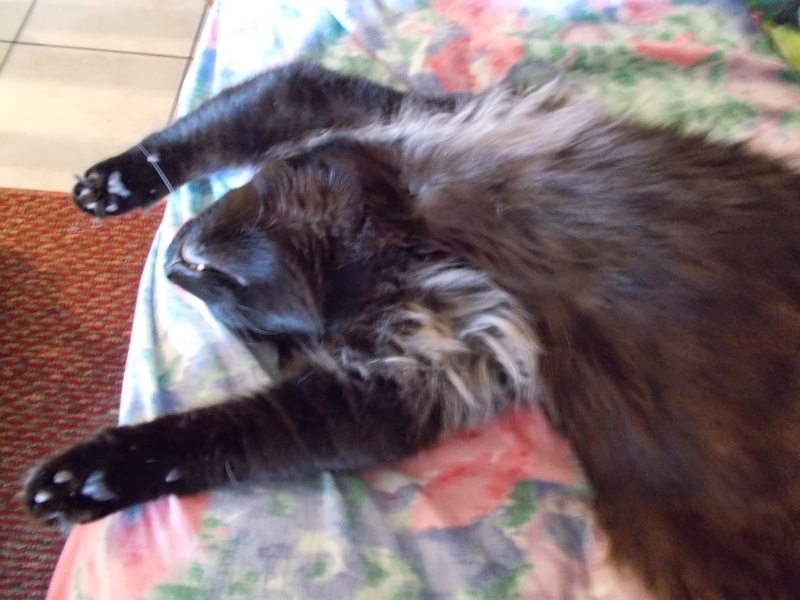 These days we are retired and have an RV that we take trips in, and so Cheswick and McMurphy are both very cosseted and well travelled felines. Love your blog, and your writing, Chrys. 'Hurricane Crimes' was great. 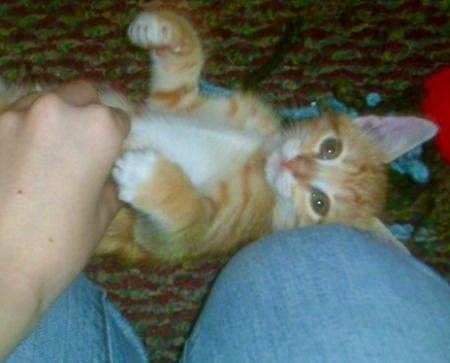 And you taking on the guardianship of four kitties is just plain awesome in my book! Thank you for sharing that story with me, Tony! 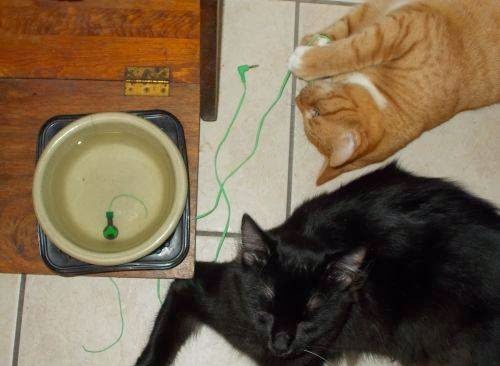 It sounds like you were meant to find Cheswick and McMurphy, and that they have a wonderful home and a lot of love. I only have stuffed animals and a spider plant named Kalanit at the moment. I've had Kalanit for 14 years now, though it's been awhile since she's grown any new branches or sprouted little white flowers. If I ever fulfill my longtime dream of having a few acres for a small hobby farm, I'd love to get a lot of pets—horses, goats, dogs, cats, rabbits. guinea pigs, birds, pigs, lizards, you name it. Since I can't bring myself to feed one animal to another animal, there are only a few types of herbivore lizard I'd be able to own. And as much as I love snakes, there's no way I'm ever keeping frozen rodents in my freezer, unthawing them, and having to handle them, even with tongs. I have lots of pictures of cats from my three Israel trips. They're like squirrels over there, usually feral instead of house pets. Some of the cats I've encountered there have been very friendly, though, and came over for petting and company. I'm going to have to look up a spider plant to see what they look like. When I was younger, I wanted a farm with all sorts of animals, but I wouldn't be able to keep up with a farm now, not with my back. I don't really like snakes all that much, so I never be able to own one. Even if I didn't mind the frozen, dead rodents. But I'm with you on that one! Ick! 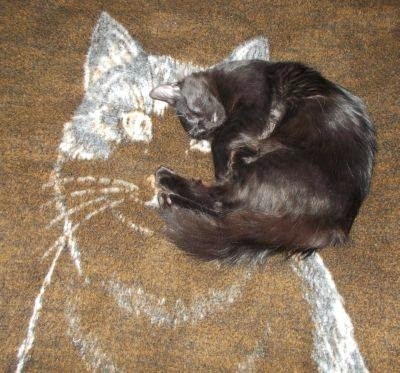 Nothing quite as enchanting as a cat or many cats. Yours seem to have a literary bent, so how lucky that is. Glad you're in the catology event. I look forward to your story. But I do hope your cats had a lovely birthday, Chrys! I gave them special treats and played with them extra long before I went to bed, so I think they had a good birthday. So cute, Chrys. I can't believe I'm this late. I love cats! Absolutely adorable! I love cats, but unfortunately, my husband is allergic.